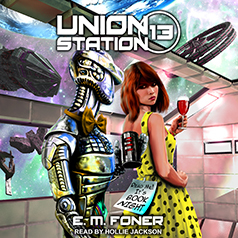 E. M. Foner presents Book 13 of the EarthCent Ambassador series. The Stryx offer EarthCent help in reaching out to the wide-spread human communities, but as usual, it comes with a catch or two. Kelly see an opportunity to increase her book hoard, just as publishing on Union Station begins to take off and Donna's daughters enter a friendly competition. But who will publish the most expensive book of all?